“It’s funny because people think I have an office,” says Sarah Feldman, a jewelry designer and creator of the Ridgewood Market, a monthly gathering of area vendors who sell their handmade goods — a classic artisan flea market. Feldman, 25, works mostly from home, save for market weekends when she heads down to the Greater Ridgewood Youth Council and manages more than 70 vendors with a regular turnout of anywhere from 400 to 600 customers — mostly Queens residents and Brooklynites. 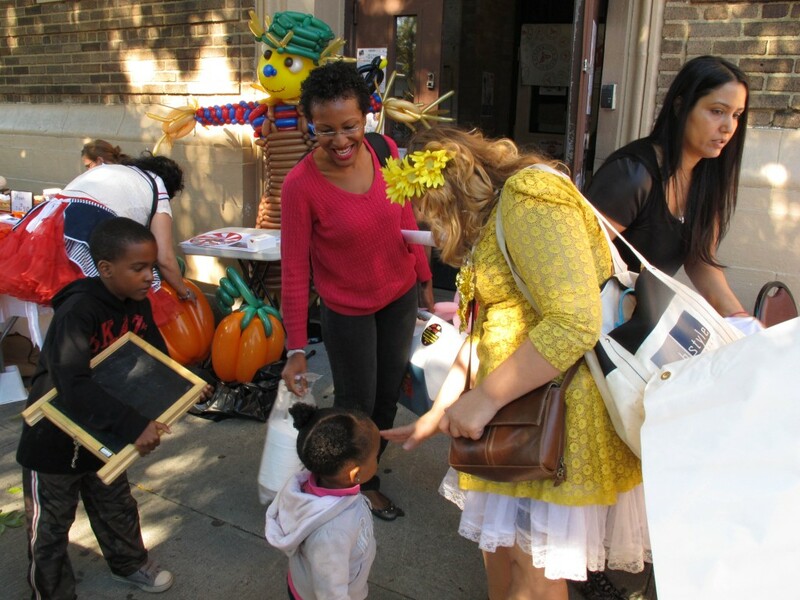 First debuting in April 2013 at Gottscheer Hall, the Ridgewood Market was the first of its kind in the neighborhood. “The arts scene is developing and underappreciated,” Feldman said. 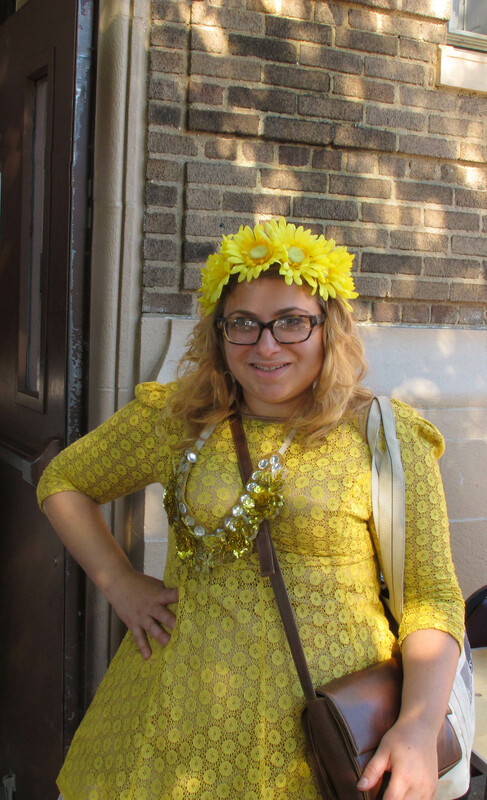 She wanted to give Ridgewood an outlet for its budding creativity. Described as an “Autumn Weekend Event” on the flier Feldman printed for September 2013, the most recent market took place on Sept. 28 and 29. That Saturday, Feldman was a vision of canary yellow in a lace-trimmed dress complete with a matching flower crown — not unusual for her preferences for hoop skirts and Victorian-era fashion. She mingled with vendors, made signs and directed newcomers to the basement of the Greater Ridgewood Youth Council. A few vendors were setting up tables outside the building. Items ranging from children’s toys, spices, balloon pumpkins and original art to wine cork magnets were put on display for sale. Sarah Feldman, 25, created the Ridgewood Market this year to create a place where small businesses – everything from jewelry makers to bakers – could showcase their wares and services. When she has time, Feldman sells her own jewelry at the market. Items from her online store have been sold in Hong Kong, Greece, Italy, Australia, the United Kingdom and most recently, Singapore. She primarily makes plastic double-sided earrings with picture prints inside. One of her best sellers is a pair with President Barack Obama’s image. Feldman’s boyfriend, Neil Myers, an architect, who has known her for three years, designed the market’s room layout. “I’m Sarah’s right and left-hand man,” Myers, 34, said jokingly. True to his words, Feldman said she had to leave the market on by noon on Saturday. U.S. Rep. Grace Meng (D-Queens) invited her to the “Make It In America” Expo in Glendale, a showcase of borough businesses — and Myers was designated to take over operations in his partner’s absence. Personal chef Shena Williams, 38, said she was new to vending and felt grateful to Feldman for the opportunity to show off her skills. A former resident of the Glendale/Ridgewood area, she traveled from the Bronx. “I don’t like the commercialism of restaurants,” she said, thankful the market grants her exposure on a more personal basis. Henry Bayer, a retired resident of Ridgewood in his late 70s, says he always stops by the market whenever possible. “It’s a sickness of mine, coming to flea markets,” he joked. Grace Brigham, 44, a balloon artist, travels all the way from Long Beach to participate in the Ridgewood Market. Feldman attended Parsons, The New School for Design and graduated in 2010 with a bachelor’s degree in fine arts and no business experience. After college, she was unemployed, only able to find positions as an intern. Feldman eventually worked in retail until she became sick and could no longer work. Her illness kept her at home and without much company—so, she came up with the Ridgewood Social, a project that later gave her the inspiration to begin to Ridgewood Market. The venture, launched in June 2012, uses the power of online networking to promote events where Ridgewood residents can gather and participate in activities ranging from bar crawls and picnics to dating activities for singles within or close to Ridgewood. Hailing from Houston, Texas, Feldman has been a New Yorker since 2006. “Because I moved here, I want to give back to my community,” she said and thinks the same of recent newcomers to Ridgewood who fit the demographic of gentrification — young people from Bushwick, Williamsburg and Greenpoint. She emphasizes that she is a supporter of small businesses and tries to keep the Ridgewood Market as local as possible. As far as future goals Feldman has for her marketplace? “I want to see a pickle vendor,” she said, laughing over coffee at the Europa Café on Madison Avenue.